It’s a saying that goes back before online marketing when people would sell via direct mail. They’d create a list of addresses and blast them with flyers and other advertisements. Today’s lists, however, are digital. Step 1 – Get people who are interested in your product to opt-in to your email list. Exchange their email address for something of value to them, i.e., a lead-magnet. This is what we covered in Module 2. Step 2 – Once you have their email address, you need to know what to do with it. You need to know how to nurture your customers and avoid email fatigue. You need to warm them up by providing exceptional value and customer service and once you have, they will be willing to listen to your sales pitch, but not before. That’s the power of email marketing and more specifically, automated email marketing, because you don’t have time to do this manually. If you’re still on the fence about starting an email list, don’t be. You NEED a list so that you can stay in contact with those who are already familiar with, and like, your content. It’s much harder to reach new customers so make sure you keep up with the ones you already have. Plus, having an email list allows you to announce special deals, freebies, new product releases, etc. Rant Done! On with the how. There are two main email providers that I’m most familiar with – ConvertKit and MailChimp. MailChimp has been around the longest and is usually where people initially flock, but it doesn’t hold a candle to the power and ease of use of ConvertKit. I wrote a blog post about it that I’d like you to check out before moving forward. 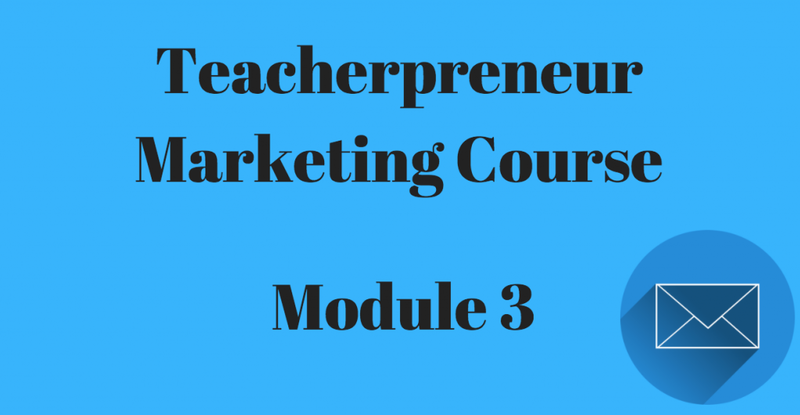 You can access it here –> https://teachwithfergy.com/how-to-choose-the-right-email-provider-for-your-teacher-author-business/. The gist though is that you need to automate and create multiple lead-magnets. To do this, you need ConvertKit. 2) Create a series of emails that welcomes your new customer into your world. There are two secrets to email automation. The first is to provide exceptional value and make your customers feel like the real people they are. Always remember that these are people, not email addresses. Treat them like people. The second secret is to only send them material that is applicable to their situation. If they teach first grade, don’t send them information on the advanced Calculus project you just came up with. ConvertKit makes it very easy to do this. People in my funnel are tagged in two ways. Either they are placed into a certain tag based on the lead-magnet they opted in for (i.e. they downloaded a digestive system .pdf and so are tagged as a biology teacher) or they choose their tag inside my ‘What are you teaching’ funnel. See below for a picture of email number 1 inside this funnel. This is very powerful because once they choose their adventure if you will, they will only receive emails that relate to the subject they teach. Each sequence is essentially the same, just with products that are specific to the subject. Once your customers are in the proper sequence, that’s when you start sending out value. In my case, I send out a series of emails that include paid products that my audience gets for free. These products are ready to use but also open up their eyes to what else I offer inside my store. Lastly, I ask them to choose a product they’d like from my store. This prompts them to visit my store and look through all my products. They send me the TPT link, and I respond with the product. 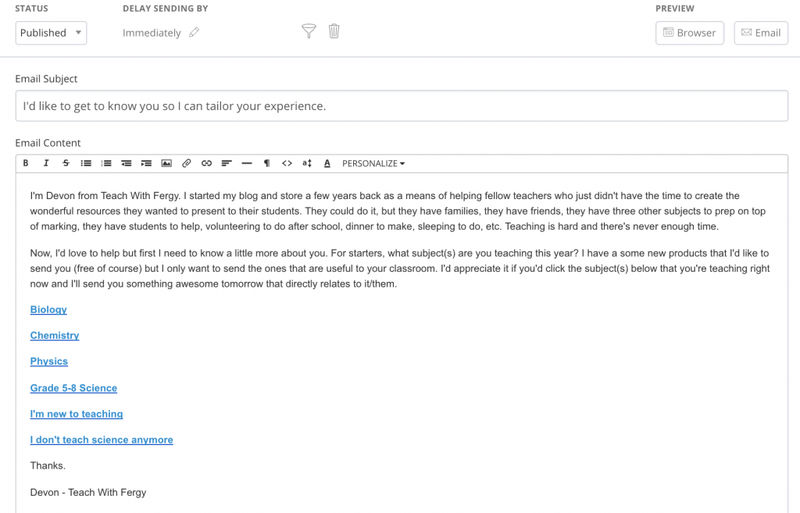 Email #1 – Published 1 day after the person is tagged as a biology teacher. In it, I provide a link to download one of my digital scavenger hunt activities. I’m able to utilize the power of ConvertKit to create an additional tag for someone who clicks this link. Anyone who does will be tagged as interested in my scavenger hunts and will be placed in a follow-up sequence that will send out an additional email in the near future but also allow me to target them later on with new scavenger hunt products. Email #2 – Published 2 days after the previous email. Here I send out a biology product from a different line of resources, my lab station activities. Again, my goal is to provide value but at the same time, expose my audience to the different kinds of products I offer. As with email #1, anyone who clicks the link will be tagged as interested in my lab stations. Email #3 – Published 3 days after the previous email. This email follows the same script of providing value, exposure, and additional tagging, however, in this email I take things a step further. Since I give the choice of different grade levels, I am able to further tag this person as either a Grade 8 and up teacher or a Grade 5-7 teacher. I’ll use this data at a later time when crafting my promotions. Email #4 – Published 4 days after the previous email. This email follows the same script as above by providing value and allowing me to collect information. Email #5 – Published 2 days after the previous email. Step 1 – poke the pain point (the number of hours teachers spend prepping for their class). Step 2 – relieve the pain by providing them anything from my store they’d like for free. People love it when you relieve their pain and will reward you in the future. By visiting and browsing my store, they will see everything I have to offer so may see something else they’d like to buy in the future. Once they complete the sequence, their journey with you isn’t over. Hopefully, they’ve clicked some links and have been placed in additional sequences. In addition, I place everyone who completes the subject-specific sequence into a collection sequence that continues to build our relationship for months to come. ConvertKit has dozens of tutorials in addition to the thousands created by users. They also have an exceptional Facebook group where you can get answers to your questions in minutes instead of days. To see a brief ConvertKit demonstration video, CLICK HERE.